Meeting and assistance on arrival at Aizawl Airport, our representative welcomes and escorts and would hand over the documents and brief the tour programme to you. Drive to Aizawl city (35km/ 1hrs) by a private car and transfer to the hotel, whilst the room keys and check-in is organized. Aizawl is the capital of Mizoram. Evening visit local market. Overnight in Aizawl. KV Paradise: In memory of his deceased wife Rosangpuii Varte, Pu K.Chhawnthuama erected this three-storey mausoleum in the premises of his residence in Durtlang, Aizawl which was the talk of the town in the previous years. “K” stands for “Khawlhring (K.Chhawnthuama)” and “V” stands for “Varte (Rosangpuii Varte)”, therefore “KV” is the brand name of this family and also known as “Mizo Taj Mahal”. Martarte Thlan: A striking martyr’s memorial was constructed in the memory of volunteers of the Mizo National Army (later on Mizo National Front) who sacrificed their lives for the sake of Mizos and Mizoram freedom movement between 1956 and 1986. Solomon’s Temple: A group calling themselves “Kohhran Thianghlim” which literally means “The Holy Church”, is building a magnificent structure called “Solomon’s Temple” in Aizawl, the capital of the Christian state of Mizoram, in North East India. This dedicated group is certainly putting much effort and money into this ambitious project. Could this be the temple that must be constructed before Christ’s return? Millennium Centre: The Millennium Centre, an urban shopping complex maintained by a Society, “The Millennium Centre Authority” and wholly owned by the Government of Mizoram stands at the heart of the Capital City, Aizawl. The building is equipped with parking space for a sizeable number of medium sized vehicles, 333 numbers of shop units, escalators, elevators, state-of-the-art-electrical panel systems and automatic power backup, hydrant systems, alarm detection system together with sprinkler system. The structure of the entire building is expected to be one of the firmest and most advanced in the entire state. Mizoram State Museum: Mizoram State Museum is located at McDonald Hill, the centre of the Capital City, Aizawl and is owned and maintained by the Govt. of Mizoram. This small and interesting museum gives a good insight into Mizo traditions, culture and history. The variety of objects are exhibited here which are not usually found elsewhere. 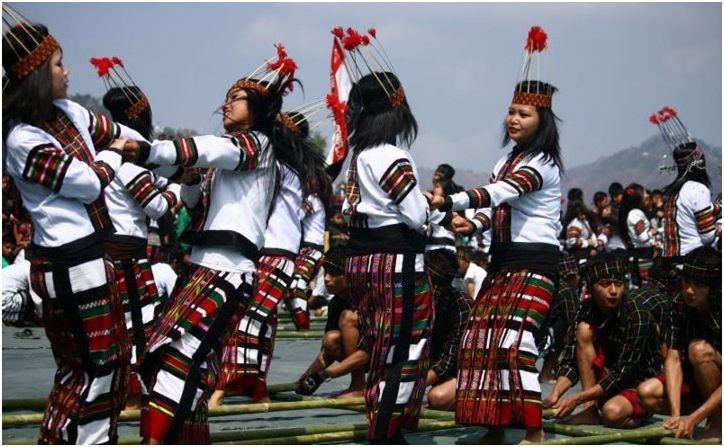 The tribal attributes of Mizoram are showcased in a separate gallery. There are rare objects, sculptures, artifacts, musical instruments, weapons, woodcrafts on display that show the rich cultural heritage of the tribes. This Multipurpose Museum was built in the year 1977. Visiting Hours: - on Tuesday – Friday, 10 am – 4 pm; on Monday and Saturday, 10 am – 2 pm; Sunday (Closed). Breakfast in hotel and drive to Reiek (35km/1½hrs). We take a sightseeing tour around Reiek area. Reiek Hill: To the west of Aizawl sprawls a prominent mountain on which Reiek village is located and is on the 5110 ft high from sea level and 35 km from Aizawl. This is one destination that one should not miss visiting. The mountain itself, though appearing to be of gentle slopes on its eastern sides has spectacular rocky cliffs notched with caves and caverns on the northern and western sides. Moreover, it is still largely covered with luxuriant natural forests preserved since the days of the chiefs. It is only an hour’s drive from Aizawl. The mountain road takes one through the lush green hills, crosses the Tlawng River as it gushes through a narrow rocky gorge, and then climbs up the hills winding up gradually making for a comfortable drive, during which one comes across a few cascades which are a photographer’s delight. Zokhua (Typical Mizo Village) is located at Reiek, Anthurium festival is held every year at the Typical Mizo Village. It is built complete down to the last eaves, with the chieftain’s house, the house of the generals and knights, a bachelor’s dormitory called Zawlbuk. Visiting this spot will let you imagine the early Mizo village and their houses, their way of living and so on. Overnight in Aizawl. The Vantawngkhawhthla (also called Vantawng Falls) is the highest waterfall in Mizoram (750 ft.) and 13th highest waterfalls in India. It is located 5 kilometres (3.1 miles) south of Thenzawl in Serchhip District, about 137 kilometres (85 miles) from the Capital City, Aizawl. This fall is surrounded by a lush green tropical forest filled with bamboo groves. If you can’t get enough of it you can stay overnight for it is equipped with a cafeteria and cottage for hire. Sight-seeing in Mizoram remains incomplete without a visit to the Vantawng Falls. The waterfall creates a seven storied cliff on its descent. The aesthetic beauty of the cliff with the plunging waterfall lures tourists who frequently visit the region. The waters make a gurgling sound on the way down, splashing stray droplets of water on the face of the tourists who stand underneath to watch the descent of the Vantawng Falls. Overnight in thenzawl. Chana Pawl is a religious sect settled at Baktawng village (90kms from Thenzawl & 70km from Aizawl). The members of the sect do not mind being called a religious sect because they take pride in nurturing the legacy of ‘Lalpa Kohhran’ (God’s church) founded by their ‘godfather’ Chana in 1966. Chana, who was said to have married over 20 women died in 1997; after him the legacy of ‘Lalpa Kohhran’ was carried on by his eldest son Ziona. Sixty four-five old Ziona, married to 47 wives and father of over 100 children, is responsible for the spiritual, social and economic welfare of all his family members. The Mizo community believed that Ziona’s family to be the largest joint family in the world, Zion looks after over 180 family members. There are many more family enrolled in the sect that was founded by Chana known simply as Pu Chana Pawl. Evening back to Aizwal. Overnight in Aizawl. Breakfast in hotel depart to Champai (205km/7hrs). On the way you get beautiful views of fertile rice fields fringed by the misty hills of Myanmar. Champai is a thriving border town and offers a lot by way of shopping for imported goods from Thailand and other far eastern countries. We check you into your tourist lodge for the night. The evening is free to explore this vibrant town. Overnight in Champai. The most significant lake in Mizo history Rih Dil is ironically located in Burma, about 3 kms from the Indo-Myanmar border. It was believed that the departed souls pass through this lake before making their way to Pialral or heaven.The Mizos in the past believed that the ‘other world’ was divided into two, and that all spirits went to a place called ‘Mitthi khua’ (village of the deaths), then some moved on to ‘Pialral’ (heaven); but to reach their eternal abodes, they had to pass through the lake Rih Dil. Mualbuhvum: There is an exotic and romantic spot on the paddy field of Champhai named Mualbuhvum. It lies on the road side, 3 kms from Champhai town on way to Hnahlan village. Many people use to go to this place for evening stroll. Some visitors used to compare this spot with the country roads in West Virginia (USA). Champhai Paddy Field: Champhai Paddy Field is the largest flat and plain area in Mizoram. The main road that leads to Zokhawthar runs through the heart of this field. It is located just by the side of Champhai town and there is a good view from the uptown. There is one locality named Zotlang at the field, another tourist attraction lies here named Pine Hill covered by lush green forest. After breakfast, drive to Aizwal (205km/7hrs). Evening leisure. Overnight in Aizawl. Breakfast in hotel and transfer to Aizawl Airport (35km/1hrs) towards Delhi/major cities of India, tour end. Please send a photocopy of wire transfer to our company to let our bank follow up the transfer. For deposit within India, please use IFSC/NEFT - see bank details given on this page. For deposit outside India, please use SWIFT remittance - see bank details given on this page. -The package rates are net to Boni Tours and Travels. -Quotation based on category of rooms at all hotels and vehicle. -Check-in / Check-out time will be 12.00 Noon at all hotels. -Any change in the property / Room category or transfers after confirmation will be extra payable. -Any of the service which is not used after confirmation will be not refundable. -All reservations are subject to availability at the time of confirmation. -Foreign tourists are exempted from Protected Area Permit in Manipur, Mizoram and Nagaland. -For Arunachal Pradesh - Foreign Tourists required a Protected Area Permit (PAP) in a group of two or more persons can obtain PAP for a period of thirty days. Foreign Tourist visiting Arunachal Pradesh shall have to Pay Indian Rupee 1800/- per person as Royalty to the Government of Arunachal Pradesh and application for PAP are to be applied through Local Tour Operators only. -For Sikkim - Foreign Nationals must obtain Inner Line Permit (ILP) to visit Sikkim in some places. -For Indian Tourist - In Arunachal Pradesh, Mizoram & Nagaland required Inner Line Permit to entry respective states. -	Accommodation: On twin sharing rooms or single room. -	AP Basis: (Tea/Breakfast/Lunch/Dinner/Mineral water). -	Transportation: All transfer and sightseeing. -	English speaking Guide throughout the tour. -	The entire entrance fee to Museum, Monument, Village fee etc. -	Protected Area Permit / Inner Line Permit. -	All the applicable taxes. -	Any personal expenses like tips, camera, laundry, beverages like Beer, Wine, and Cold Drinks etc. -	Any cost in the event of Flights cancellation due to weather condition, landslide, strike / band etc. - 50% of total tour cost must be paid upon confirmation by bank transfer. - 50% the rest of amount will be paid after or before arrival. - 50% must be paid upon confirmation by bank transfer. - We don’t accept payment by credit card over the Internet. -20 days before arrival date no cancellation fees. -15 - 20 days before arrival date 25% of total bill will be charged as cancellation fees. -10 - 15 days before arrival date 50% of total bill will be charged as cancellation fees. -05 - 10 days before arrival date 50% of total bill will be charged as cancellation fees. -01 - 05 days before arrival date 100% of total bill will be charged as cancellation fees. Opposite Civil Secretariat, Itanagar, Papumpare District, Arunachal Pradesh, Pin Code: 791111, India. Please apply the funds to account 6501960730 which is maintained at your Itanagar Branch in Arunachal Pradesh.